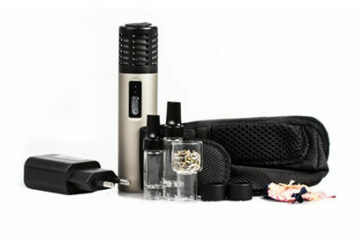 The Arizer Extreme Q Vaporizer comes from a brand that brought vapers the Arizer Air and Arizer Solo. With the Extreme Q, Arizer looks to extend its quality of craftsmanship to a desktop unit designed to vaporize cannabis and other dry plant material. 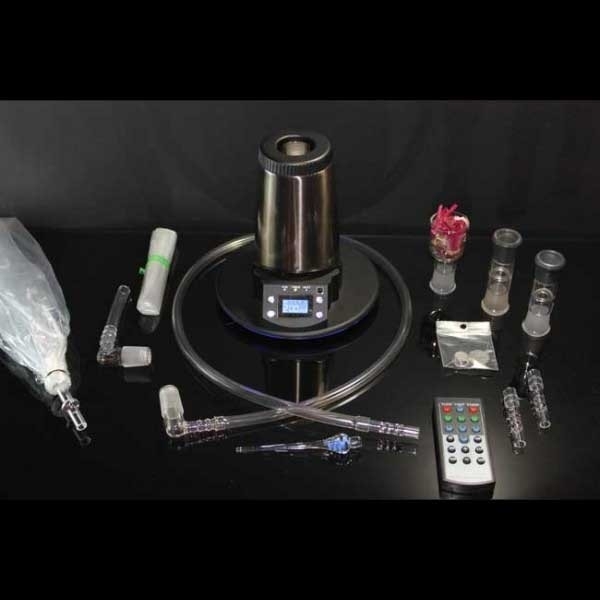 Desktop vaporizers have gained popularity as many of those who use cannabis for medical reasons consider vaporization of the herb as a more efficient and effective alternative to traditional consumption. 1. Battery life and capacity: N/A. The unit uses a power adapter. 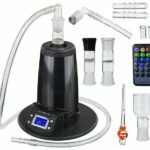 This is a seriously powerful desktop vaporizer at a very realistic price? Don’t want to shell out $350 or so for the Volcano? Get this bad boy for half the price and use the money you saved to buy some high quality herbals. 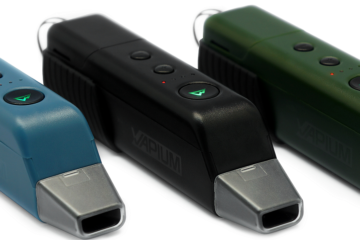 Desktop vaporizers are typically conceptualized as a device that can be shared among a group. The presence of individual parts such as mouthpieces and tubing, however, make it possible to share and use the unit personally in a manner that is clean and safe. 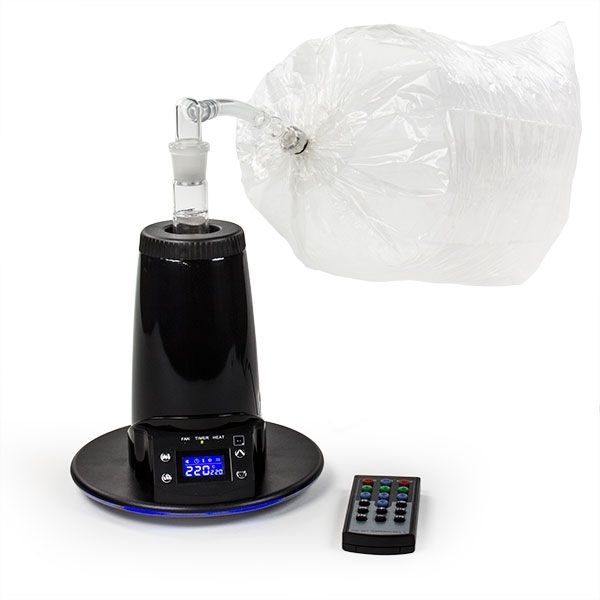 Most desktop vaporizers use a removable bag or balloon or a piece of long tubing known as a whip to monitor vapor production and even preserve aromatherapy for vaping at leisure. Compared to some other desktop vapes out there, the Arizer Extreme Q offers some notable advantages over its competitors. Some vapers value discretion in a vaporizer, and Extreme Q is one of the more discreet – and elegant looking desktop vaporizers that you will find. It has a tower-like shape that isn’t that much different from a single-cup coffee brewer. It could easily be placed on a kitchen counter and pass for an appliance. It has a sleek and metallic chrome black finish with an LCD screen on the front that permits easy monitoring of the unit’s temperature and quick adjustments. 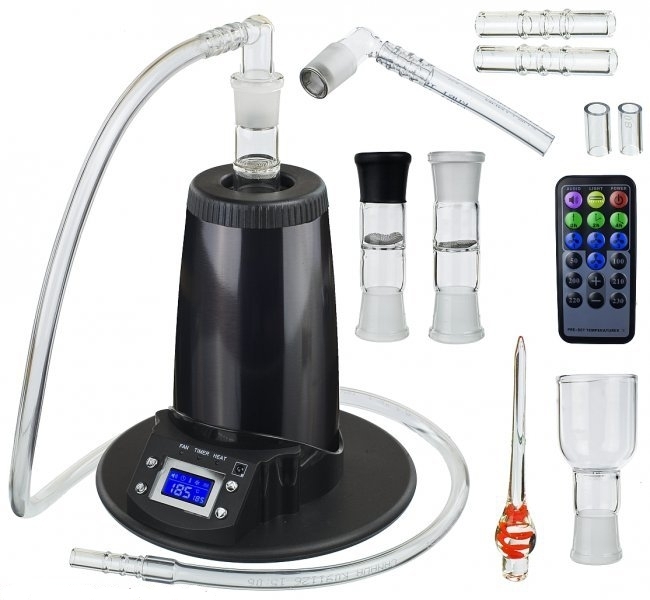 In comparison to the benchmark for desktop vaporizers, the Volcano by Storz & Bickel, this rig is far more compact. It also has an improved fan that is quiet and does not draw undue attention when the unit is in operation. And it costs less. So the question is, does it outperform the Volcano? Right away, the presence of a remote control adds extreme weight to the Extreme Q’s user-friendly appeal. It can be started from quite a distance away, and this is convenient. Because desktops take a few minutes to begin producing vapor, you can go about other tasks after starting the unit with the remote and waiting for the temperature to reach vaporization levels. Preparation is hassle-free. Plant material is placed into the bowl which is then inserted on top of the heating element before the unit is powered on. The bowl is of a sufficient size to make filling it easy and less susceptible to waste. All that remains is to attach a balloon or whip, a process that takes just a few seconds, and start vaping. Let’s begin with the price. For all of the features it offers, the Extreme Q is a value at less than half of what the Volcano retails for. As such, it is a perfect entry-level desktop vaporizer. But don’t let that fool you into thinking it performs at an entry-level position. Nope, this thing flat out rocks! You have a couple choices for ROI – a 1-foot whip, 3-foot whip, and bag. The three foot whip is my personal preference as it allows the vapor to cool a bit more. The Arizer Extreme Q also has three fan settings, allowing you to dial in the perfect flow. 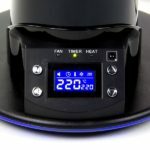 The “fast-heat” ceramic heating developed by Arizer for this unit gives a temperature range of 122° F – 500° F. That is a lot of versatility, and this is important for vaping cannabis. Too much heat will burn the herb, and too little will fail to yield sufficient vapor. The best desktops allow for precise and reliable temperature adjustments, and you’ll find that here. Arizer has also redesigned the Solid State circuitry in this unit to make it 50% more energy efficient. 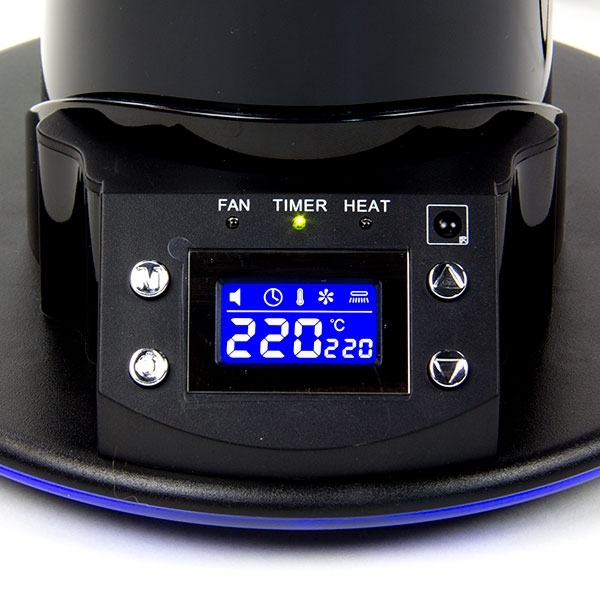 A more efficient vaporizer does a better job of vapor production. The Extreme Q is also backed with a 3-year warranty, one of the longest in the industry. The Extreme Q uses a lot of glass parts. While glass tends to produce a cleaner, more flavorful vapor, glass also breaks. A lot. You’ll need to be extra careful when removing parts for cleaning. If you use a whip to vaporize, the tubing and the vaporizer itself can become significantly hot. Some type of cooling unit such as the one used with the Volcano would be a useful addition to this unit and bring it right in line as a serious competitor. For the price, the Arizer Extreme Q overdelivers, bringing elegance, solid craftsmanship, and great performance to the table.